I've never seen one of these before. I've showed it to a few people that are very familiar with vintage Nintendo and they have never seen one so I thinks it's safe to call it rare. It's marked "1989 Nintendo of America Inc." and measures 19 1/2'" wide, 16" deep and 23" tall with the wheels. It's in near mint condition and has a very crisp, clean appearance. The red bars on the shelves are spaced perfectly to lock your system's legs in place so it won't slip when you put your game in. My first thought when I saw this was that they had just stuck some Nintendo stickers on a cabinet but the original owners told me they bought it when they bought the game system. After I fit the games and system in place it became obvious that this was manufactured for the Nintendo NES system. The games and system are not including they are just to show you how nicely everything fits. There are tens of thousands of games and systems out there but when will you see another one of these? First of all, do you see the little holes on the sides? Those are to lower/raise the shelves. If it was specially designed, those wouldn't be there. Second, the back is exposed plywood. I doubt something like this would be so cheap as to not cover the back. Some guy customized his TV stand, and he did a pretty good job. How would you get one of those Nintendo cabinets originally? Were they sold in stores? And if so then how come we dont see more of them? Yes, I believe it to be authentic as well. 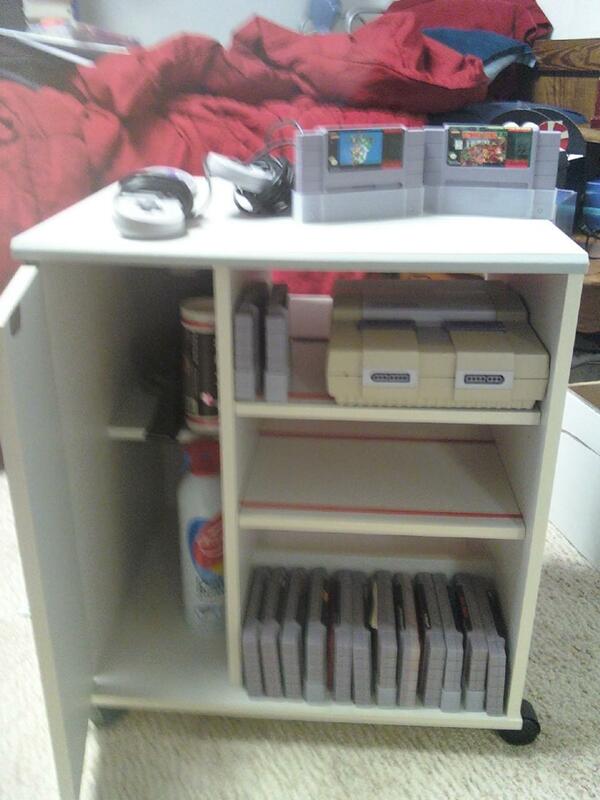 Definetly a sweet cabinet to put your NES stuff in! Somebody on another sight said he had one as a kid but trashed it and threw it out. I don't remember seeing them in stores back then either. I don't think they made many and that's why you don't see many. Could it have been something given to Nintendo employees? Here's a link to Gamesniped where they show this. Below is what somebody wrote about it. I didn't see a way to email him but maybe he could tell us where he got his (he was only six though). Oh man I had that roller cart for Nintendo. I also remember bashing it down so I can throw it away for the big pickup in town. That Mario was very bad and mine didn’t have him on it. Maybe it was done in taste by my mom or my 6 year old self. $200 would of been nice though. It is missing a rubber part on the right side (pictured).....looks as if it was never installed by the owner....This does not affect how it works and could be easily repaired by someone willing to spend the time. I believe this to be a rare piece because I have searched and searched for a comparable item and cannot find one. WOW, I guess that confirms that it is authentic. I like the cabinet better and I like the cabinet's price better! 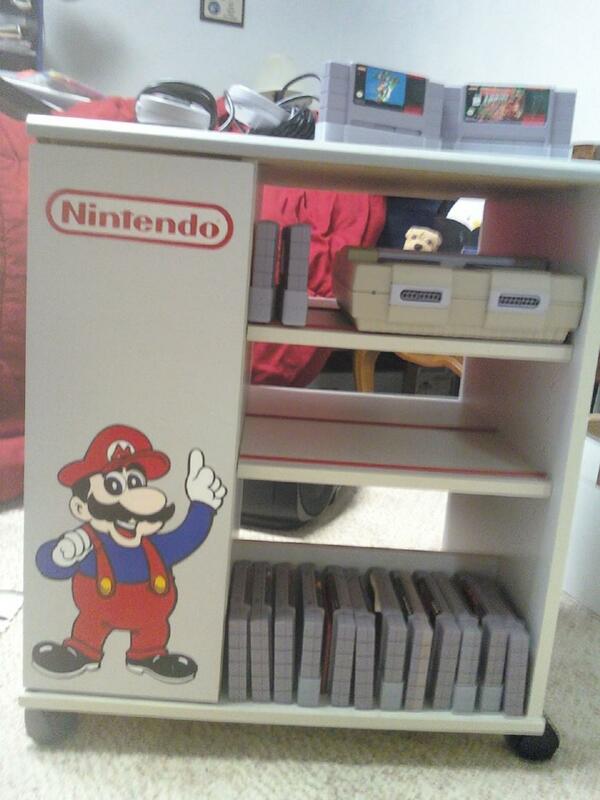 I have the same nintendo cart/stand. Got it a year ago off of Ebay and paid $25. So if anyone wants one, keep looking. There is also one listed on Ioffer.com It's a great little cart. Holds my system, games and in the pull down drawer i have my controllers. I buy alot on Ebay. It wasn't a buy it now, but the bidding ended at a strange time. I've seen maybe 4 or 5 or these stands on ebay and ioffer. If this guy can get $999 for his i will seriously consider selling mine and finding another one. I think it's the real deal. I found one at a yard sale last summer, games and system included. $20 for all of it. Let me attach a picture. Mine does have a bit of water damage on the top surface though. Use a coaster! But it's great. I can put my TV, my SNES, my N64, and my Wii all on the same stand.